User satisfaction greatly impacts a buyer’s decision to purchase a product, and G2 Crowd leverages the power of thousands of peer reviews to help you with these decisions. Their newest report comparing accounting products places Acumatica cloud ERP ahead of the pack. One of the best ways to know if the software you’re planning to buy is the right one for your organization is by reading peer reviews. This is where G2 Crowd comes in. They’re the leading business software review platform, using over 400,000 verified user reviews to compare software options. Their new report, which you can check out here, compares user satisfaction on accounting product software and pits Acumatica against three established competitors. Out of 26 categories, Acumatica won 16. G2 Crowd comparison reports are based on reviews by confirmed users, and these reports, according to G2 Crowd, go even deeper than their Grids. They only use data from public sources. Technology buyers, investors, and analysts can confidently compare their software options before making their selection. The end user’s experience is our top priority. 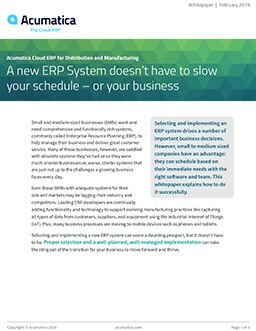 Acumatica is a true cloud ERP. What makes us different is that our platform was built using modern, cloud-based, and innovative technology from the ground up. Our modern cloud ERP platform allows you to focus on growing your business and not on the technology that runs it. From one system, you can access financials, CRM, manufacturing, distribution, and more. And it’s fully customizable. Gartner’s Magic Quadrant for Cloud Core Financial Management Suites for Midsize, Large and Global Enterprises names Acumatica as having the highest customer satisfaction of all vendors surveyed. Users based their scores on Acumatica’s usability, quick and easy implementation, above-average core ledgers, and ability of our cloud ERP software to meet their needs. One nonprofit organization that evaluated many ERP providers and ultimately chose Acumatica is Great Commission Publications (GCP). The company, which produces Sunday school curriculum, needed a cloud ERP solution that could handle their financial and operational data needs. Since implementing Acumatica’s ERP software, they’ve benefitted from having an Acumatica partner located near them for face-to-face meetings, using Acumatica’s numerous reporting capabilities, having remote access to the system, and being able to manage their customer order flow more efficiently. Their full story (along with other stories of customers who have found success using Acumatica cloud ERP) is available for you to read. Doing your due diligence before making a large purchase, such as a cloud ERP system, is necessary. G2 Crowd’s report is one source of unbiased, factually-based information. You can also evaluate Acumatica’s ERP software and platform in person is by attending Acumatica Summit 2019 in Houston, Texas (January 27-February 1, 2019). You’ll have the chance to network with actual users and with Acumatica partners and executive team members, who make it a point to be available during the entire event. Finally, you can contact us at any time. We want to help you to find out if Acumatica’s complete, streamlined, and adaptable cloud ERP solution is right for you.